Ah, Woody. America's favorite toy cowboy. Beloved by Andy for years, beloved by audiences for... also years. And now you too can look like the sweetest, bravest cowboy to ever have a pull string. 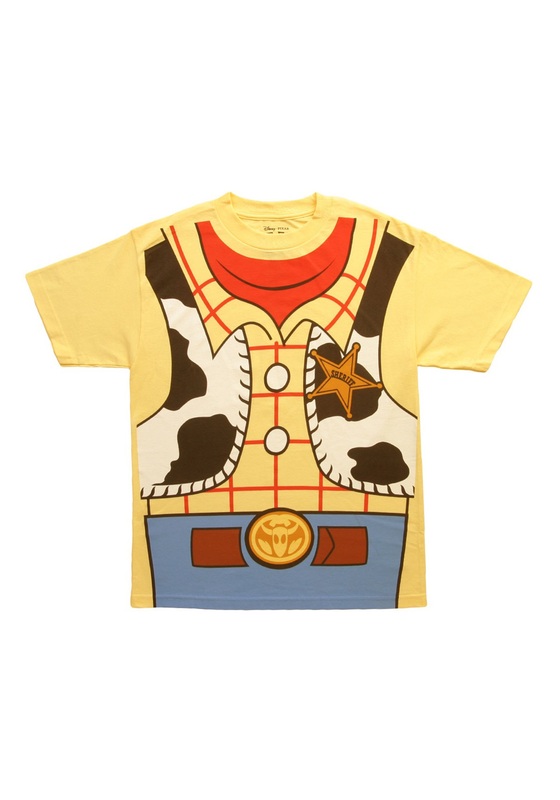 Just pull this t-shirt on and explain to Buzz he's not a space ranger, he's just a toy. But he won't understand, and all the other toys seem to like him, so eventually you've got to realize he's a good guy, deep down. Of course, eventually Andy has to grow up... and... say... goodby- Oh come on! We can't even do this. Did you see Toy Story 3?! It's heartbreaking, man. The whole office had to take a day off after that movie. What are we saying? You get it! That's why you're here. You love Woody too and you want to honor him like a true fan, with this freaking awesome T-shirt. Just watch as you walk down the street and people stop you to pull you into a hug, or to gush about their favorite moment from the movies, or just to wonder about Mr. and Mrs. Potatohead and how that whole relationship is going. You've got a friend in us, partner. Doesn't have anything on the back. Still cute though.